Established in the year 2011, we , “Newgenn, India”, we have become a leading organization involved in manufacturer and supplying a quality approved range of Fashion Accessories, Gifting products and Business Promotional items. All these products are manufactured by us using superior grade raw material in the entire production process, which is procured from the reliable vendors. These products are in great demand in the market for their various features like, gift items are known for their durability, latest trends and easy to clean and maintain. For achieving maximum level of clients satisfaction, all these products are delivered at their destination through our various transportation modes. We are also supported by experienced and skilled professionals, who hold years of experience in this domain. These experts remain in regular contact with the clients to know their exact requirements and serve them in an effective manner. With the unending support of our expert, we are able to add more than 5000 products in our range. Moreover, in order to cater to the various requirements of the clients, we also have the capability of customize these products in an effective manner. Under the able guidance of our chairman, 'Mr. Nirmall Tulsyan', we have been able to become the top most priority of the clients. His in-depth experience in this domain, has helped us in enhancing the quality and patterns of our products as per the latest market trends. We have two offices of 1500 sq ft area and located near to Goregaon Station, Mumbai, India. We are active member of Retailers Association of India. In a span of 3 financial years, Newgenn India has grown as a Corporate Gifting company. We have developed more than 700 corporate clients in the last 3 years. “Newgenn India” is a newly formed organization which has been taking care of Corporate requirements for Gifting and Business Promotions. Having an experience of more than 7 years in this industry, we sure have the zeal to predict the requirements according to upcoming festivals and situational requirements. Innovation has been our USP and we have always looked forward to give our clients a special product at an unbeatable quality and best price. Our strength lies in 100% quality and customer driven approach in the arena of gifts. We always focus on the feedback received from our customer. We have earned the trust and continued patronage of our growing list of clients, who are some of the best companies in the world. If clientele and product range were to be yardsticks, then we would win hands down over other companies in similar business. A perfect composition of strong business relationships - commitment to outstanding service and a wide application of knowledge has formed a perfect compound, making us the preferred partners by our delighted customers. Further, maintaining consistency in quality, committed timelines in deliveries and ethical business practices has helped us position ourselves strongly in the highly competitive industry and earn a formidable reputation amongst our clients. “Our Promoters” have been in Business for a long period, which is the reason we have developed a comprehensive industry knowledge and understanding of the market trends. “Newgenn India” is a part of a group of companies which has been in the line of Business for over 4 decades. Based its roots from Iron and Steel Trading, the group has diversified itself into Chemicals, Exports of Stainless Steel Kitchenware and Houseware Products, Corporate Gifting and Promotional Products. Over a period of last three years, there are more than 5000 products which have been added in the products range. We have established ourselves in the industry as the leading exporter of Kitchenware, Cookware, Houseware and Giftware products owing to our widespread network of quality conscious vendor’s. By means of procuring our range from trusted and reputed manufacturers of the industry has allowed us to carve a niche in the global market. Our keen eye to details and our passion for perfection has helped us in garnering fruitful relations with our associates that are selected after due consideration. After considering the aforementioned factors, we strive to carry on our business with mutual benefit. A good team plays a vital role in establishing an organization and all our teammates put in their strong efforts in terms of quality and quantity, managing time limits. We have a pool of personnel who perform stringent tests and even conduct trips to overseas Trade-Fairs to study the latest market trends and product developments. The managing team in our organization is inspired by the thoughts of the Great Mahatma Gandhiji. Further, we also conduct regular training sessions to keep the team updated about the latest customer requirements. These training sessions and seminars assist our team members in enhancing their work efficiency as well as establish a strong foothold in the market. We are active participants of Giftex Exhibition held at Nehru centre Worli. Recently in February we had displayed a wide range of products to all the visitors. We actively participated in both the versions of Giftex in the year 2012. Newgenn India is headed by Nirmall Tulsyan after completing Masters in Finance in the year 2000 - 2002, he headed for export sales and has covered a major part of Europe. In the year 2011, Newgenn India was formed. A customer is the most important visitor on our premises. He is not dependent on us, we are dependent on him. He is not an interruption of our work, he is the purpose of it. He is not an outsider to our Business, he is a part of it. We are not doing him a favour by serving him, he is doing us a favour by giving us the opportunity to do so. 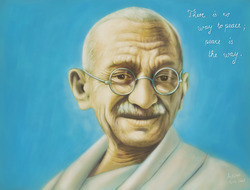 Mahatma Gandhiji These principles are inscribed in our heads and keeps us going through the rough patches of our lives. We Newgenn India hereby request all our customers to give us an opportunity to serve you.